DEPTHX extends a probe towards a potential target during trials at the La Pilita sinkhole in Mexico. TheEnvironmentally Non-Disturbing Under-ice Robotic Antarctic Explorer (ENDURANCE)robot probe is scheduled for some tough tests in the next few weeks. The goalis to help NASA eventually explore the underwater environment of Europa, one ofJupiter's moons. Researchers will start getting closer toEuropa on the campus of the University of Wisconsin at Madison. Lake Mendota will provide a good test of the ability of the ENDURANCEprobe to create three-dimensional maps of underwater environments. ENDURANCE is is a $2.3 million project fundedby NASA's Astrobiology Science and Technology for Exploring Planets Program.The probe is an underwater vehicle designed to swim untethered under ice. Theprobe also will collect data on conditions in those environments use sensors tocharacterize the biological environment. If all goes well, tests will continue in apermanently frozen lake in Antarctica later this year. Researchers aredeveloping and testing the technology for a possible underwater explorationmission on Europa far in the future. 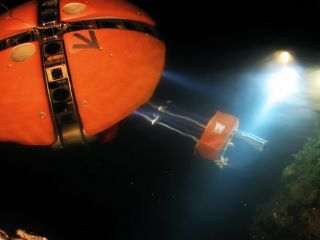 The probe is a follow-up to the DeepPhreatic Thermal Explorer, a NASA-funded project that completed a series ofunderwater field tests in Mexico in 2007. Science fiction fans have several reasons todelight in this research. In the movie 2010, based on the story byArthur C. Clarke, probes explore the frozen surface of Europa and find strongindications of life. In the film, there is a great sequence showing theexploration of Europa by remotely operated surface probe (see video). In his 2002 story Slow Life, sciencefiction writer Michael Swanwick creates a fascinating picture of theexploration of liquid environments on Titan. He introduces the idea ofrobofish. Awkwardly, she straddled the fish, lifted itby the two side-handles, and walked it into the dark slush. The Mitsubishi turbot wriggled, as if alive. With one fluid motion, it surgedforward, plunged, and was gone. From NASA. Read more about the possibilities for liquid water on Europa.